Many of you may be under the mistaken impression that I like to exercise. Ummmm… no. I post exercise pictures, sweaty selfies, my crazy circus moves (like the side plank, left) to motivate myself and anyone else who might be inspired to follow my example. But like exercise? No. I exercise because I like to do other things. I want to be able to train my dogs and compete with them in not only obedience, where you just have to run for a short distance, but in agility as well, where you run for a minute or so – remembering an obstacle course, and directing your dog to do those obstacles. I want to take hikes in pretty places. and I want to be able to travel to those pretty places, preferably without pain and on my own two feet. I don’t like to shop, so I want to spend as little time in grocery stores as possible. That means to check the produce myself and pick the good stuff, select all the other things necessary, maneuver my cart through the store, take the stuff out of the cart, put it in my car, bring it in my house and put it away myself. I want to cook delicious meals for myself, my family and my friends. That means being on my feet for an extended period of time. I want to go out with friends and family and not worry about being a hindrance to them. I want to eat good food! Exercising burns calories, so I can eat more good food. Including desserts (especially chocolate)! I want to use my brain! And I want to keep my cognitive function for as long as possible. So I exercise. I don’t particularly like it, but I do it. I’ve found that combining cardio and strength for a very intense 30 minutes 4 or 5 times a week is quite effective at keeping my joints happy, the weight off, and my brain going. 21 Day Fix Extreme works for me most of the time. (I find it easier on my knees than 21 Day Fix.) 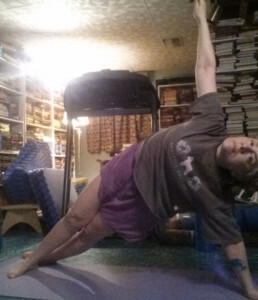 Every couple of months I do PiYo for a week, just for something different. But I don’t exercise to be entertained. I exercise for the outcome. So, there you have it. I don’t like to exercise, but I do it. Life is nuts. It’s just crazy, and getting crazier by the day. So many things to do, places to go, stuff to get done. It’s practically impossible to keep it all straight. Dentist appointment. Hair appointment. Take the car in. Go grocery shopping (and where did I put that clean-eating shopping list?). Take the dogs to the vet. Buy that birthday card. Do laundry. 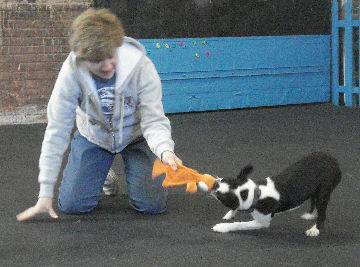 Go to agility class once a week. Train the dogs. Work out. Answer emails. Write. I know I can’t possibly remember all that. Something is sure to fall between the cracks. I rely on Google Calendar. It’s my planner, my to-do list, my reminder. I can sync it to my pc and all my devices. I can color-code reminders and appointments. Whenever I think of something, I just open my Calendar and enter it. When I enter an appointment on my phone, it shows up on my pc. If I think of something I have to do on Monday, I can enter it on my tablet and I can see it on my phone when I’m running around. 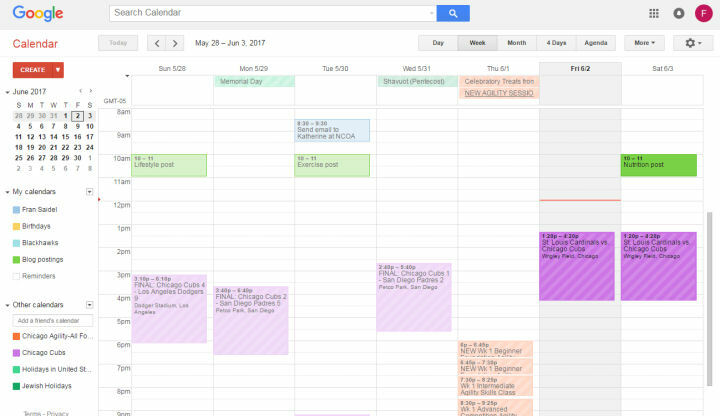 And the calendar has a repeat function for appointments that repeat, like weekly classes. I know that I haven’t even scratched the surface of all of its capabilities, but I’m getting good use from the Calendar, and it’s helping me to erase some worries. I worry that I’ll forget to do something, and being able to enter it the instant I think of it has eased my mind somewhat. I’ll probably have to use it more, and explore it to discover other ways to make life easier. 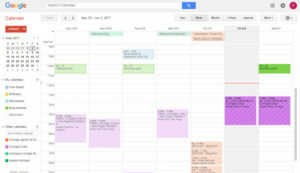 You can access holiday calendars that are formatted for the Google calendar. 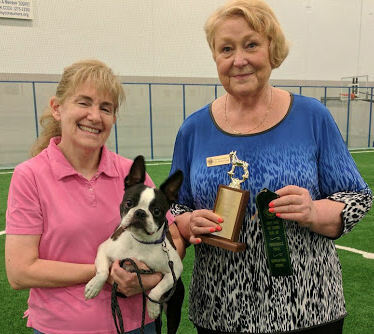 My dog Agility instructor even has our club calendar in the Google format. And I can even find out when the Cubs game is on my Google calendar! If I don’t have to worry about things I have to remember to do and where I need to be, then I can focus on reaching my goals!